The 12 Volt Accessories On My RV Don't Work When We Are Plugged Into Electric. I have a 1983 Layton Travel Trailer. It won't run any of the interior lights when plugged into AC power; it will run the plugs fridge and air. The lights only work on battery power. What is wrong? ANSWER: Hi Colby, based on your description it sounds like there are problems with your RV Power Converter . When your RV is plugged into electric or when the generator is running the RV Power Converter takes the place of your RV's House Batteries and provides 12 Volt DC power to your Travel Trailer. The RV Power Converter also charges your house batteries when it is plugged in. 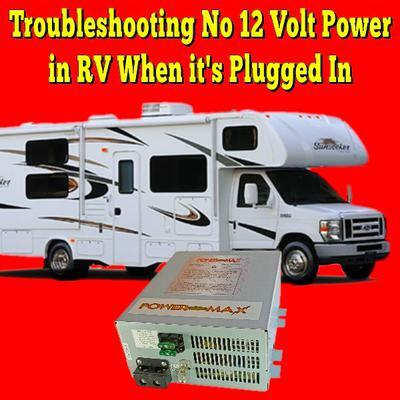 The problem could be that 120 Volt power is not getting to the Converter or that there is an internal problem with the Converter or that the 12 volt power from your Converter is not reaching the 12 Volt DC Circuits of your Travel Trailer. The Converter is in the electrical compartment of your Travel Trailer along with most of your travel trailer's 12 volt fuses and 120 volt circuit breakers. Once you get to the electrical compartment of your RV follow the steps below. 1. With the RV plugged into 120 volt electricity go to the electrical compartment and listen for a humming sound. If you hear a humming sound we know that the Converter is receiving 120 volt power when your travel trailer is plugged in. Important Note: In newer RVs you may not hear a humming sound from the converter. Regardless if you hear the humming sound or not, move on to step two. 2. Unplug your Travel Trailer from 120 Volt electric and go back to the electrical compartment and visually inspect the wiring. You are looking for any loose connections, corroded connections and any wiring that appears burnt or frayed. If you find any burnt or frayed wiring you will need to take your Travel Trailer in and have it repaired by a Certified RV Technician. to clean them. Now try plugging in the travel trailer and see if this resolved the problem, if not, move on to step three. 3. With the travel trailer unplugged check for any blown fuses and tripped circuit breakers. Replace the bad fuses and reset the circuit breakers as needed. Plug in the travel trailer and see if this has resolved the issue. If none of the above resolves the problem or if a fuse blows again or a circuit breaker trips again; you need to take your travel trailer in and have a Certified RV Technician diagnose and repair the problems. IMPORTANT NOTE Do not attempt to open up the converter and repair it. There are no user repairable parts in there. If you start fiddling with the inside of the converter you can cause further damage to the electrical system of your RV or create the potential of an electrical fire in your RV. The troubleshooting steps I outlined above are very basic, but they should be able to uncover the most common causes of the problem you are experiencing. There are more comprehensive steps you can take to find some more uncommon causes of your problem, but I do not have the space here to detail each and every step. If you are the type of RVer that would like to be able to better diagnose electrical problems in your RV then you might want to get a copy of RV Electrical Systems: A Basic Guide to Troubleshooting, Repairing and Improvement by Bill and Jan Moeller or RV Repair and Maintenance Manual: Updated and Expanded by Bob Livingston. Both of these highly rated books have some great troubleshooting tips on diagnosing problems with your RV's electrical system. These tips will save you both money and time. Comments for The 12 Volt Accessories On My RV Don't Work When We Are Plugged Into Electric. The comment that says "There are no user repairable parts in there." is slightly misleading. As there may be a fuse on the circuit board that can be replaced. I have had this on two convertors that had no 12V output when on shore power. It is likely a low battery condition. Newer trailers rely on constant power, for example, if your "alarm" is coming from your carbon monoxide detector without a relevant cause, it is likely a low battery condition in the 12volt system. What I do is disconnect the battery if I am not using the trailer and it is not connected to 110 volt power. we have a beeping alarm in the side of our travel supreme 5th wheel and can't figure out how to stop it or what the warning sign is all about. Everything is working just fine but we can't stop the the alarm. any ideas? ?